If you’ve never worn contact lenses before, there’s a good chance you are nervous and unsure about what to expect. This is only natural, but we are here to tell you there is nothing to fear. Over the years, there have been major advancements in modern medicine and contact lenses specifically, providing millions of people throughout the world with a comfortable and safe way to have clear vision. In fact, it is estimated that 30 million Americans wear soft contact lenses. 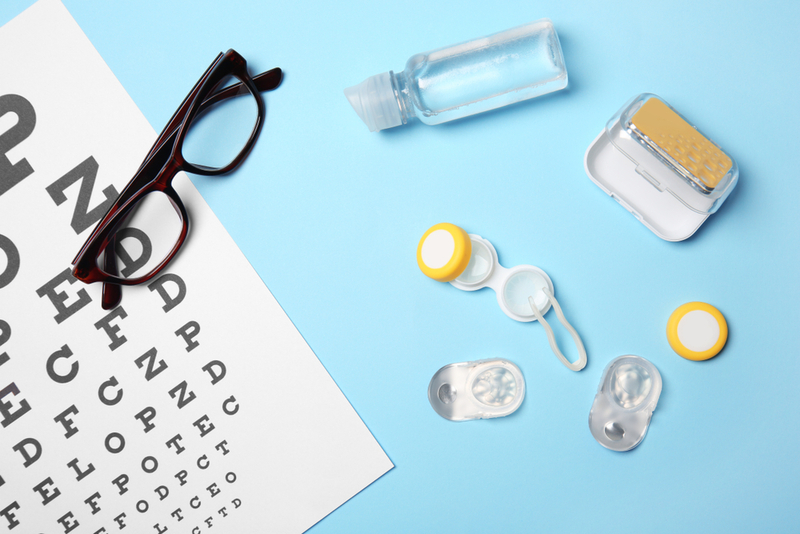 Many people mistakenly believe they cannot wear contacts if they have any type of eye condition, such as astigmatism or multi-vision needs in one eye. However, this couldn’t be further from the truth. These days, there are literally hundreds of options on the market today for contact lens wearers. From colored lenses to bifocal and astigmatism lenses, your options are truly endless. But for many, it isn’t just the idea of putting the lens itself in their eye that is intimidating, but the actual exam. It is quite common to have concerns about your eyes and feel uncomfortable ‘sticking’ something foreign in there. Before we get to that part, let’s look at the actual contact lens exam. Depending on your age and needs, the exam will likely involve several different machines, all of which aim to take measurements and images of the different components of your eye. This is nothing to fear, as these tests are over in a matter of minutes and will leave you feeling just fine. The ‘air puff’ test is one that many fear, but it is really quite fast and hardly noticeable. Once these tests have been performed, your doctor will then take a closer look at your eyes, looking for any signs or symptoms of potentially harmful conditions. It’s OK to leave your contacts in your eyes – Unfortunately, many people make the mistake of leaving their contacts in their eyes overnight and for too long in general. Contacts prevent the cornea from getting oxygen, so the longer you keep them in, the more problems you could have. Your contact lenses can get lost behind your eye – This is perhaps the biggest misconception people have about contacts. There is a membrane that wraps around the inner surface of the eyelid, called the conjunctiva. This protects the eye and makes it impossible for a contact to get lost. You are too old to wear contacts – You are never too old for contacts. As we age, our eyesight changes, as do our needs and lifestyle. If you’ve never worn contacts before but think they may be a good fit for you now, please don’t hesitate to give us a call. To learn more about what to expect during a contact lens exam or with wearing contacts, please give First Eye Care DFW a call today.